At his surgery center near San Diego, Rodney Davis wore scrubs, was referred to as "Dr. Rod" and carried the title of director of surgery. But he was a physician assistant, not a doctor, who anesthetized patients and performed liposuction with little input from his supervising doctor, court records show. So it was perhaps no surprise, in 2016, when an administrative judge stripped Davis of his license, concluding it was the only way to "protect the public." State officials also accused two former medical directors of Pacific Liposculpture of enabling Davis to act as a doctor. That approach to oversight has created a troubling legacy of laxity, an investigation by Kaiser Health News shows. In case after case, as federal or state authorities waved red flags, state-approved accreditation agencies affixed gold seals of approval, according to a KHN review of hundreds of pages of doctors' disciplinary records, court files and accreditor reports — which are public only for California surgery centers. One accreditation inspector called a doctor's anesthesia technique "impressive" just months before the state medical board accused her of "gross negligence" for putting patients in deep sedation without the training to save them if they stopped breathing. Another doctor who is fighting a medical board accusation of "gross negligence" over two patient deaths in 2014 and 2015 got his own surgery center approved by an accreditor in 2016. In yet another case, Medicare officials declared a state of "immediate jeopardy" at a center that put an untrained receptionist in charge of disinfecting surgical scopes, a Medicare inspection report says. Its accreditor renewed its approval within a week. Patient deaths after care in a California surgery center reached a 14-year high with 18 cases in 2016, though the total dipped to 14 the following year, according to state records based on reports filed by the centers. 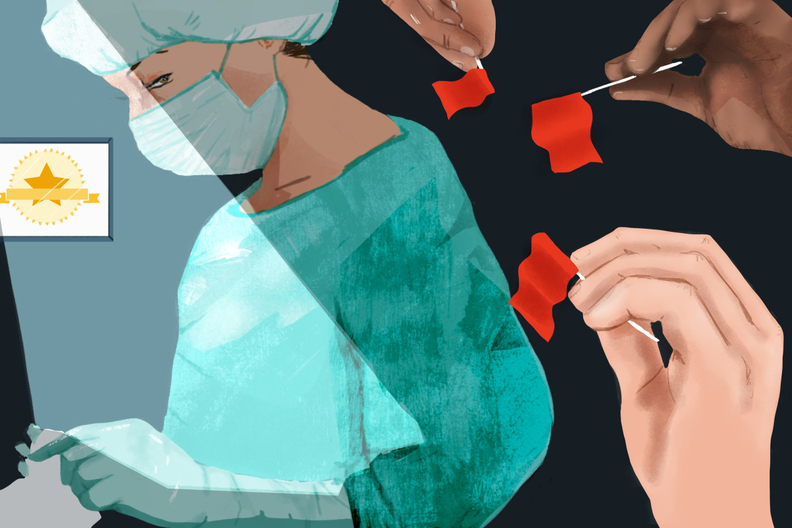 Since 2010, at least 102 patients have died after care in the state's surgery centers. Such facilities perform a variety of outpatient surgeries and now outnumber hospitals nationally. State Sen. Jerry Hill, a San Francisco Bay Area Democrat, chairs the committee that oversees the state medical board, which reviews and approves the state's surgery center accreditation agencies every three years. Briefed on the investigation's findings, Hill said this "definitely warrants a deeper examination into what's going on at the surgery centers and how the accreditation process is working today — and [whether it's] providing the patient protection I was hoping for when we established it." California's oversight of surgery centers was upended about a decade ago when a physician's legal victory led the Department of Public Health to conclude it could no longer license doctor-owned surgery centers. The doctor had filed suit, challenging the requirement that he and his surgery center both maintain a license. He prevailed, putting state oversight of the doctor-owned centers in flux. State medical board officials denied a request for death reports that included centers' names, making a more comprehensive review of the centers or their accreditors difficult. Some of the same accreditation agencies that approve surgery centers, though, have been under fire with members of Congress after a Wall Street Journal report pinpointed gaps in their oversight of hospitals. On May 1, 2012, the Institute for Medical Quality, or IMQ, a San Francisco-based accreditor, inspected Advanced Medical Spa in Rocklin, Calif. The inspectors were required to check whether the person administering anesthesia was "qualified and working within their scope of practice." The inspector's note says the surgeon's wife, a pediatrician, was performing "conscious sedation" anesthesia and said her technique with the drug propofol was "impressive." The standard was marked as "met" and accreditation was awarded through 2015. A month later, the state medical board launched an investigation of the pediatrician, Dr. Yessennia Candelaria, over complaints that she was handling anesthesia for plastic surgery procedures without "requisite training in anesthesia, including Propofol," the board's records show. Investigators for the Medical Board of California found that before and after the accreditor's review, Candelaria was using propofol to put patients in a state of "deep sedation" even though she didn't have the "advanced airway" training in how to rescue them if their breathing shut down. Medical board authorities deemed the lapse "gross negligence" in an accusation filed in 2014 that also accused her of abusing controlled drugs. Her medical license was put on probation for seven years. Medical board authorities recently moved to revoke her license over unauthorized prescribing, and she has not yet filed a written response. Victoria Samper, vice president of ambulatory programs with IMQ, said she could not comment on specific facilities. But she did note that California law allows doctors to practice outside of the field they initially train in. She also said if a doctor is doing so, an inspector would be expected to "drill down" into the physician's practices. The medical board said in a statement that the private accreditor who dubbed Candelaria's technique "impressive" reviewed her work with a different patient than those cited in the board's accusation. "If the Board becomes aware that there is an accreditation agency that is not following the law when accrediting outpatient surgery settings, the Board would look into it," the statement said. Accreditation agencies have stood by eight California surgery centers facing the federal Medicare program's harshest consequence — "involuntary decertification." It's a rare sanction that amounts to being deemed unfit to care for seniors. On March 22, 2016, California Department of Public of Health inspectors notified federal authorities about a state of "immediate jeopardy" at Digestive Diagnostic Center, a small endoscopy center south of San Francisco. A state inspection report said the center had pressed its new receptionist into duty to disinfect medical devices that probe patients' colons — with no formal training. The center failed to protect patients and had "ineffective infection-control policies which did not address hiring … of qualified individuals," the report concluded. Something else happened that day as well. The Accreditation Association for Ambulatory Health Care, or AAAHC, renewed its approval of the center, which the agency describes as a "widely recognized symbol of quality" to patients and health insurers. Medicare involuntarily decertified the facility a month later, which meant the federal agency would no longer pay for seniors' care at the center. But with private accreditation still in place, private insurers would be likely to continue funding care there. Dr. Michael Bishop, a former California medical board member, said the case exposes a gap in state oversight if a center falls below one overseer's standard but meets another's. "You want no one to have easier [approval] process than any other one," he said. "That's quite egregious." Kevin Calisher, president of the surgery center management firm Calisher & Associates, said his company took over management of the center in 2017, and that he could not comment on Medicare's findings. The medical board's statement said Medicare is not required to notify the board when it decertifies a surgical center. "Now that this situation has been brought to the Board's attention, however, the Board will be looking into the matter," the statement said. The inspectors' checklist included a review of complaints filed against the center by a state "licensure board." Davis had already been publicly accused by the state physician assistant board of engaging in the unlawful practice of medicine and gross negligence for failing to appropriately care for patients who experienced complications. The inspector checked the box for "substantial compliance" and awarded the center approval through April 2018. That decision was "enraging actually, outrageous," said Todd Glanz, a San Diego-area attorney. He represents a patient, Cecilia O'Neill, who went to the center for liposuction a few weeks after it was accredited. O'Neill returned a few days after her May 28, 2015, procedure, complaining of pain, dizziness and signs of infection, her lawsuit alleges. But she claims her condition got worse. On June 9, 2015, she went to an emergency room, where she was told she had sepsis and needed emergency surgery followed by a stay in the ICU, according to her lawsuit. Glanz said O'Neill was left with a hospital bill of nearly $200,000 and ongoing disfigurement. Davis and Dr. Harrison Robbins, the facility's former medical director and other owner, have denied wrongdoing and are fighting the ongoing lawsuit. The following year, in February 2016, Davis faced an eight-day administrative hearing over whether he should keep his license as a physician assistant. A central issue was whether he truly worked under a doctor's supervision, as the law requires, or hired a figurehead who would exert little control. One 2010 email discussed in court was by Davis, saying he hoped his new supervising physician, Dr. Jerrell Borup, would not be "another clumsy physician getting in the way." Davis "purposefully and intentionally set out to create a business arrangement that looked legitimate on paper," Judge Susan Boyle wrote, "but allowed him to manipulate the system and run a liposuction business without the interference of a physician." The two former medical directors of the center were accused by the Medical Board of California of "aiding and abetting" Davis' unlicensed practice of medicine. Neither doctor actively supervised Davis, who performed all the procedures, the accusations say. Davis has denied wrongdoing in each proceeding and declined to comment for this report through an attorney. One of the former medical directors, Borup, surrendered his license in 2016. The other, Dr. Harrison Robbins, is fighting the medical board's similar case against him. The controversy did not deter AAAHC, which earlier this year approved the center through April 2021. Robert Frank, a San Diego attorney who represented Davis and Robbins, said Robbins has retired and the public should have no concerns about Davis' ongoing administrative role at Pacific Liposculpture. "[Davis] knows the business, he knows the procedure and he knows he's being watched and scrutinized" during the ongoing legal case, Frank said. Davis contested his license revocation but lost that case in Sacramento Superior Court. He's now challenging that decision in appeals court. Betsy Imholz, former director of special projects for Consumers Union, who reviewed the findings for this report, said the case was shocking. "There are huge gaps in California law, clearly," she said. The incidents did not stop the facility from getting accreditation in 2017 from the Chicago-based Joint Commission, the nation's most prominent accreditor. Oneyda Mata, 40, was the first to die, on March 29, 2014. According to her autopsy, she called 911 from her car, struggling to breathe. Although her liposuction at the surgery center was 22 days earlier, the autopsy lists Diamond Surgery Center as the "place of injury" in her death from a blood clot lodged in her lung. Dr. Roya Dardashti admitted no fault, but reached a $200,000 settlement in the family's lawsuit. The sum became public only because the family filed legal records saying Dardashti failed to make some payments. MaryCruz Elizalde, 42, was the second to die, on Dec. 10, 2015. She was in recovery after a tummy tuck and liposuction at Diamond Surgery Center when she went into cardiac arrest and was taken to a hospital. Her autopsy says she died from internal bleeding and shock "as a consequence of complications of surgery." Elizalde's partner's lawsuit alleged that an unlicensed anesthesia provider at the center was involved in her care. The case was voluntarily dismissed after the partner was imprisoned in an unrelated fraud case. State law bars doctors from operating in an unapproved facility at levels of anesthesia that rob people of their "life-preserving" reflexes. Whether the facility operated outside of that limit or erred in either woman's care wasn't noted when the center got its initial approval to operate in 2017. With a slightly different, new name, Diamond Surgical Institute, the same location and same lead doctor, the facility now appears to have full accreditation on the state's website for surgery centers. Joint Commission spokeswoman Katherine Bronk said the center was awarded "limited temporary accreditation" in 2017 and 2018 after "limited" inspections. Those limited inspections did not include a check of patient medical records because they're designed for facilities "not actively caring for patients." "If the surgery center had not been following the law but made compliance with the law part of its corrective action plan, it would not necessarily be denied accreditation," she wrote. "As a private accreditor, our goal is to help organizations identify deficiencies in care and correct them as quickly and sustainably as possible." Dardashti did not respond to calls or email requests for an interview. The medical board declined to say whether it has received a report of a patient death from the facility since 2014, saying the information is "confidential." State law requires accreditors to perform a "reasonable investigation" of a surgery center's past, which includes a check to see if its doctors have a license, which Dardashti did. The checks should go deeper, said Imholz, of Consumers Union. "If past is prologue, we should be looking at what the key players, owners and doctors involved, what they have in their records," she said. "It's relevant; it should be looked at." "Despite Red Flags At Surgery Centers, Overseers Award Gold Seals" originally appeared in Kaiser Health News. Kaiser Health News, a nonprofit health newsroom whose stories appear in news outlets nationwide, is an editorially independent part of the Kaiser Family Foundation.